Freesat was set up to ensure that everyone can access the best of free digital TV, no matter where they live in the UK. freesat is a not-for-profit company owned by the nation's two most popular broadcasters, the BBC and ITV. 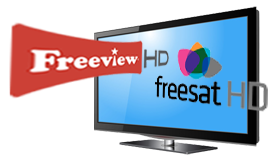 Freesat brings you over 140 great digital TV and radio channels. Favourites like BBC Three, BBC Four, ITV2, ITV3, More 4 and Film Four are all yours, with no contract and no monthly bills. Plus freesat offers up to 70 hours a week of HDTV from the BBC and ITV at no extra cost. To recieve freesat you will need a working satellite dish, Aerialwork can advice you on all aspects of Satellite TV reception call 07974 435 166 or use the call-back request below and we will call you back.